Climate change is something that (rightly) concerns us in the modern world. However, it’s been dogging our family for millions of years, as new research suggests it drove one of our relatives extinct ~1 million years ago1. This relative, called Paranthropus robustus, was one of the last survivors of a unique branch of humanity. They’d flourished across Africa for more than a million years. Then, climate change ruined the party. We are currently the only species of human living on earth. However, this is the exception, rather than the norm, for our family. For most of our history multiple human species of co-existed2. Famously, we lived (and mated) with Neanderthals just 40,000 years ago. We see this sort of diversity stretching back millions of years. Australopithecus – the famous ape-like group Lucy belonged to – lived alongside another branch of humanity: Paranthropus2. They were also ape-like, but Paranthropus took it to the extreme. In particular, their face was ruddy massive. They had huge chewing muscles their whole face had to change to deal with. This included a massive jaw, earning them the nickname “nutcracker man”. Exactly how much nutcracking they actually did has been debated, with much of their diet still a mystery3. One thing that’s less mysterious is where they lived. They seem to have been restricted to one area of South Africa, dominated by C3 plants that were rare in the surrounding region. Maybe they were stuck there because they were “nutcracking” those rare plants. Or perhaps other humans in the area had taken over the rest of the forest. Or maybe they just didn’t like how the rest of South Africa looked. P. robustus has been found in the brown squares. C4 plants determine land colour. P. robustus lived in a low C4, high C3 part of the area1. We could wildly speculate for days about why Paranthropus robustus was stuck in one part of the forest. But one thing is clear: having such a limited range would make them very vulnerable to climate change. If their precious patch of forest began to disappear, they’d be in real trouble. So Caley et al.1 went looking to see if that might be why this branch of humanity went extinct. They began examining a marine core from near the mouth of the Limpopo River, which flows through the region. This core preserves millions of years worth of sediments from the river, the unique makeup of which tracks changes in the local environment. Notably, they show the impact of the earth’s orbit on the environment. Over thousands of years, our planet wobbles like a spinning top; and our distance from the sun changes. When Paranthropus robustus thrived these planetary movements came together to create warmer land and cooler oceans. The resulting pressure changes caused a lot of rain near the coast, keeping their favourite forest lovely and wet1. However, the movement of planets stops for no species. Things began to change, and this lovely wet climate began to dry out. The last Paranthropus robustus site comes from during this drying phase, suggesting this shift was too much for them to survive1. Perhaps their favourite forest dried out and shrank. Then perhaps they were too specialised to move into new areas. Or maybe it was nothing they did, and other species migrated into the area with the new climate, chasing them away. Or maybe this doesn’t even represent the extinction of Paranthropus robustus. After all, this research compares the last site we’ve found to the climate record. And sure, they line up, but there might be younger sites out there that we haven’t discovered yet. But pending such a dramatic re-evaluation of the species’ history, this research seems solid. Paranthropus robustus does seem to have been restricted to a narrow area, which would make them vulnerable to the climate change documented1. And thus, it seems Paranthropus robustus was the first human species to fall victim to climate change. But at the rate we’re messing things up, they might not be the last. Caley, T., Extier, T., Collins, J.A., Schefuß, E., Dupont, L., Malaizé, B., Rossignol, L., Souron, A., McClymont, E.L., Jimenez-Espejo, F.J. and García-Comas, C., 2018. 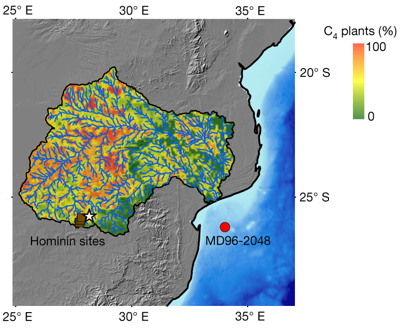 A two-million-year-long hydroclimatic context for hominin evolution in southeastern Africa. Nature, p.1. Maxwell, S.J., Hopley, P.J., Upchurch, P. and Soligo, C., 2018. 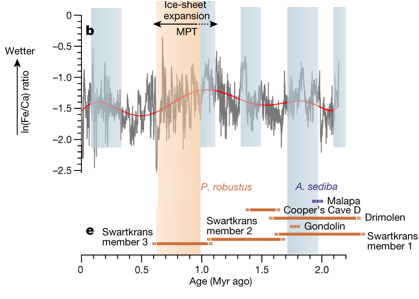 Sporadic sampling, not climatic forcing, drives observed early hominin diversity. Proceedings of the National Academy of Sciences, 115(19), pp.4891-4896. Williams, F.L.E., 2015. Dietary proclivities of Paranthropus robustus from Swartkrans, South Africa. AnthropologicAl review, 78(1), pp.1-19.